The New Media Arts (now Creative Arts and Media) degree has really broadened my perspective to all of the skills that I could learn. 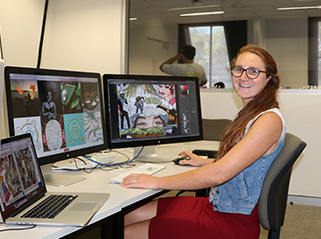 I transferred from an Illustration degree in Venezuela and chose JCU as this degree is the closest to Illustration that was on offer and I really wanted to stay in Townsville with family. It’s been great to mix my illustration background with New Media as I now have two different views of the creative process. I have my illustration background, which is my passion, but I also now have New Media skills such as photography and video. Studying here, I’ve found everything that I need. I can’t believe that I’m able to stay in the Mac labs after hours — it’s very different to what I’m used to. Back home, in Venezuela, I never would have done that — I feel much safer staying back late to study at the Townsville campus. And, the library is full of unimaginable resources, both online and physical. There’s so much content available and I find that this really enhances my projects. I love the photography studio on campus, and it’s really convenient that there is an equipment storeroom so I can borrow all the equipment that I need for photo or production shoots. There’s even a green screen and a recording studio. Throughout my degree I’ve been taught by the lecturers how to collaborate, which I think is a very important aspect of life. We learn how to work with other people and try to understand people’s lives to help make a happy workplace. I’ve worked hard and have been given internship and professional development opportunities by my lecturers. I really feel that this degree is helping me to become work-ready, so I’m excited to graduate! The highlight of my study is the Blueprint Graduate Exhibition. Having your art displayed gives a lot of meaning to your work. You are exposing yourself, your personality and it also shapes your knowledge of your classmates as you know what their journey has been throughout their degree, and what has led them to produce this work in the end. I’m constantly taking inspiration from my own personal journey and growth. I’m proud of the networking I’ve done throughout my degree, these networks have helped me find, and make the most of, opportunities that I may not have had back home. My advice to students is to never stop being creative and producing work, whether it’s for assignments or not, as the most important thing in your career is your portfolio.